A timer can be very useful in keeping up with the schedules of the day, however big or small they may be. Important meetings, lunch appointments, holidays, special occasions, etc, can all be managed with the same. The Free Timer is indeed one such tool which has a number of useful features. It is simple and can be downloaded for free onto a user's computer and/or laptop within a few seconds. The interface is basic and even children can use this tool with ease. The fact that it even times seconds is something which is impressive. Once the timer is set for a specific period, the software starts to work and upon the completion of the duration, there is an alarm that goes off. This alarm can be customized as per the user's requirements. Apart from a list of alarms, it even supports MP3 files to be set. The best thing about this Free Timer is that the user can set multiple timers at the same time. Therefore, if there are several reminders during the day, all the user needs to do is to keep adding to the list of alarms and not miss any of them. It even enables the user to remove any reminders so as to manage them better. If the computer or laptop on which the alarm is set is in the sleep mode for any reason, the monitor starts automatically at the set time and the user can hear the alarm at the stipulated time. So, there is no way in which someone can miss a deadline, be late for any appointments or forget important dates. 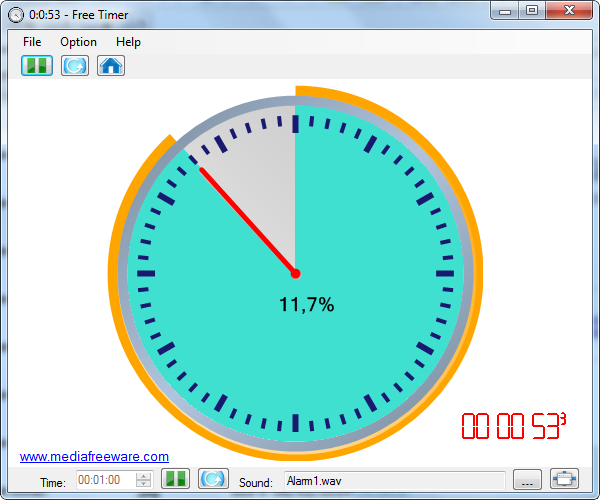 The Free Timer is, in fact, a tool that is quite easy to download and install on any devices. It is a small program that can be very handy.